Mobile golf swing alaysis for iOS and Android smartphones and tablets. Swingbyte is a revolutionary mobile golf swing analysis appcessory for use with iOS and Android smartphones and tablets. 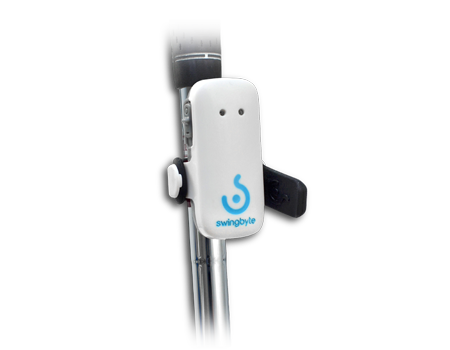 Swingbyte pairs an elegant and intuitive app with a lightweight sensor that attaches easily to any golf club just below the grip. Immediately after a golf swing, Swingbyte wirelessly transmits key swing data and interactive 3-D imagery via Bluetooth to a golfer's iOS or Android device. Valuable swing metrics captured include club head speed, path, plane, and various angles at impact. Swings recorded in the field are also automatically uploaded to Swingbyte’s website where users can access their information, share swing data with an instructor for further assistance, and see how they stack up against personal milestones as well as the Swingbyte community.